Didja see what I did there? March 14th AM: t-Rump Tweets that his military, police, and bikers will get tough on opponents. March 14th PM: 49 people killed in New Zealand by professed t-Rump acolyte. March 15th: t-Rump deletes tweet. Religion makes people a target of monsters. The pious place their faith in imaginary beings and all it does is just piss-off other beleivers of other imaginary beings. Religion doesn't do good things in the name of god, it does good things because the vast majority of humans ARE good. But monsters like Hitler and Trump and ISIS will burn the devout every time as the fuel that illuminates their egos. Stop worshipping nothing. Grow up. The air is fresh and clear outside of the religious bubble. Of the 20 poorest U.S. Congressional districts, 16 are governed by Republicans. Of the 20 most prosperous districts, 20 are governed by Democrats. Of statewide elections in the Deep South, 97% have been won by Republicans since 2008. Fake news on Facebook in 2016 was shared 18% of the time by Republican users but only 3.5% of the time by Democratic users. And since 1975 the percentage of Americans holding hunting licenses have declined almost 40%. It didn't surprise me one bit to learn that rich kids were able to buy their way into prestigious colleges. It TOTALLY surprised me that someone could go to jail for it. This is Golden-Rule America, after all, where he who has the most gold makes the rules. One of the smartest, wittiest women I've ever encountered is radio pundit Randi Rhodes. I've been listening to her programs since 2004 because no one unravels the day's events like she can. I mention her because she once lost her radio program at Air America in 2008 because she called Geraldine Ferraro and Hillary Clinton "whores". On stage. During a comedy routine. In a comedy club. One in which her fans paid to attend. It was a thing called "humor". Meanwhile, Tucker Carlson has been recorded saying MUCH worse things about women and minorities during public interviews and he wasn't being funny. He was dead serious. And he still has his job at Fox News. The lesson here is that progressives are held to a MUCH higher standard of decency than conservatives <Cough Al Franken vs Donald Trump cough> because conservatives HAVE no standards of decency. It's all about making a buck. And, finally, IMPEACH THE MUTHAFUKKAH! Trump sleeping in his hittle presidential crib with a copy of Mein Kampf nearby. 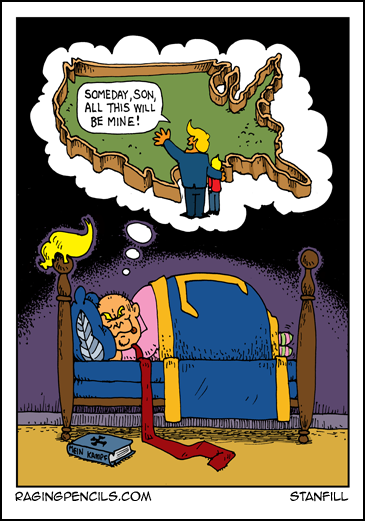 In his dreams he's pointing at America and saying Someday, son, all this will be mine!